Anybody built some or know of some good plans? Just looking for some ideas for my son's nice bookshelf speakers. They're Vienna Acoustics Haydn Grands in gloss black. He'll want something sturdy and nice looking. And I have these from parts express and are excellent for the money. 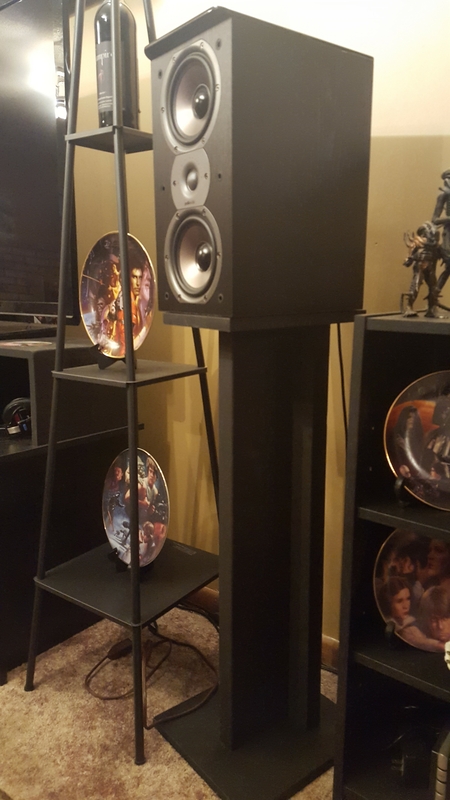 Here they are with speakers on them, By the time I added up materials these were a cheaper way to go. By all means if you want to build some bless you. Here is a pic of the stands I made out of 1x6 and 1x12 material. Very sturdy. I may steal some concepts from each of these, or perhaps copy them both. I could use a set for myself too. The pipe stands are easy to make. It's the finish that is a pain. Also, you don't need to make them all pretty if you don't want. You can clean the pipe and shoot it with clearcoat to keep it from rusting and use painted MDF if you want. Or just shoot the whole thing black or white or whatever. You could use PVC too but it's harder to find flanges that won't look stupid. If you can center the pipe properly (off set means off balance) you can get away with a single 2 or 3 inch pipe depending on how tall the stand will be and how heavy the speaker is. I have 32 inch tall stands in the Lieberry for my Totems. My first test use two 1" pipes and it wiggled a bunch. So I added a 3rd 1" pipe to each stand and it stabilized it significantly. The nice thing about the pipe is, if you put some sealant around the bottom flanges where they meet your base, you can fill the pipes with sand or shot and double your mass. I filled one of the stands in the Lieberry with play sand just to see and they went from about 15 pounds to a hair under 28 pounds with all the sand that fit in them. I've been thinking of perhaps an eco-build with concrete-filled 3" or 4" PVC, with the thought that concrete will add more rigidity than sand. We'll see. I like the black paint approach, but where would a person find black paint? I read somewhere that the individual particles of sand actually move causing friction and dissipate energy as heat. I have a set of the cheap Sanus stands I reinforced using wood closet rod. I cut the Sanus upright to length then cut four pieces of closet rod the same length for each stand. Place the closet rod out near the corners and you now have a well braced stand with five uprights. I'm going to dredge this back up for 2 reasons: to see what @mdaudioguy did or didn't do with this project, and to ask the forum what they look for in a stand and what should be incorporated in a DIY build (i.e. if YOU were going to build a pair, what would YOU do and why?). As with too many of my projects, this one has stalled. I'm hoping to do something this winter... We'll see! I do, however, have what I think is a really cool concept in mind.